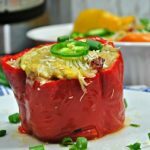 These Instant Pot Stuffed Peppers are so easy to put together and to customize to your own taste. Plus, kids get a kick out of edible bowls, which the peppers serve the role of in this dish, so you have good odds of no complaints from the kids. 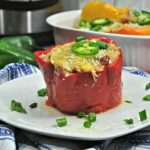 I love cooking with bell peppers because they add so much vibrant color to a meal. 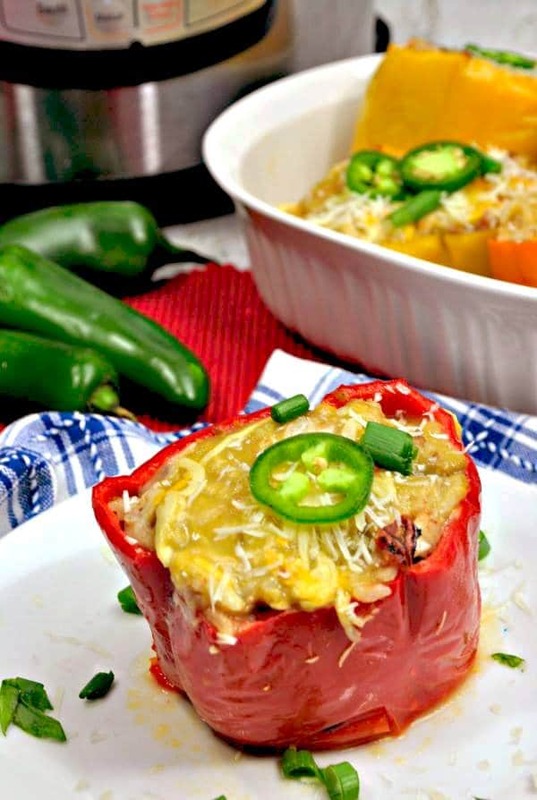 This is especially true in this Stuffed Peppers recipe because they’re the main attraction! Aside from being pretty, they’re also really good for you. They have a full day’s worth of Vitamins A and C. Plus, they contain antioxidants that help prevent cancer. 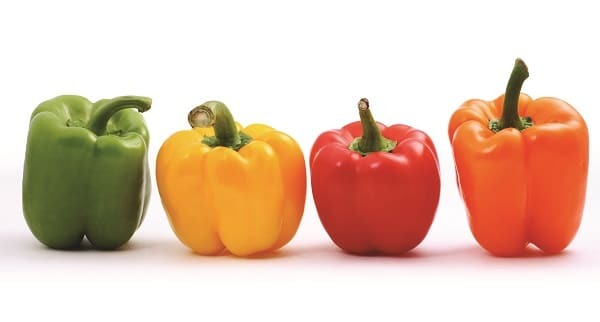 The vitamin A, along with certain enzymes you’ll find in bell peppers, contribute to healthy eyes. And the vitamin E contained in bell peppers is great for your skin and hair. 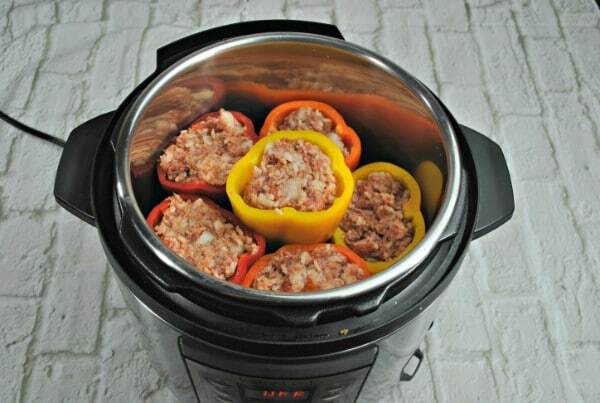 You can use any bell peppers to make Instant Pot Stuffed Peppers, but I used red, yellow and orange because I have one child who automatically dislikes any food that looks too much like a vegetable (the color green usually being the giveaway). 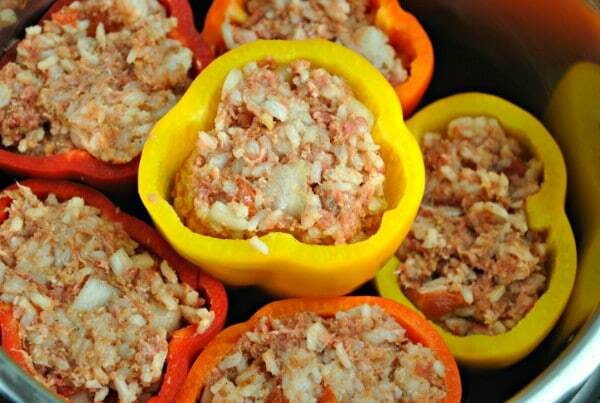 Stuffed peppers are one of those dishes that I think look harder to make than they really are. To make the process less intimidating though, I’ll break it down with some in-process photos. Slice off the top of each bell pepper and remove the seeds from inside. Rinse them off and pat them dry with a clean dish towel. In a large bowl, combine diced onion, ground beef, cooked rice, chili powder, cumin, minced garlic, salt, and panko. Next, you’ll add HALF a can of fire roasted tomatoes to the beef mixture and mix them in. Now it’s time to stuff the peppers! 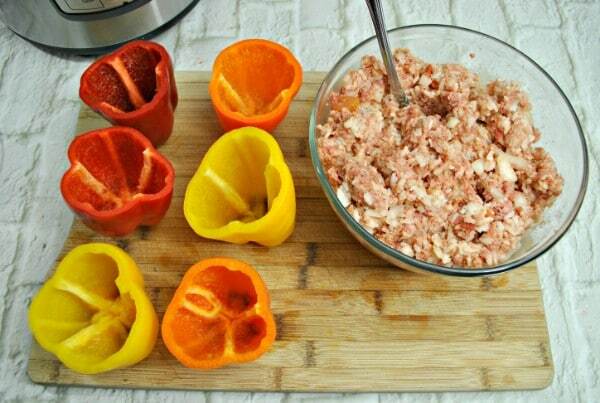 Fill each pepper with the beef mixture. Go ahead and fill them all the way to the top edge. Add 1/2 cup of water to the bottom of your Instant Pot liner. Then pour in the remaining half can of fire roasted tomatoes. Place the steam rack on top of the tomatoes. Carefully set the peppers on top of the steam rack. It’s okay if you can’t get them to all squeeze in to have the tops even. As you can see, my center pepper wouldn’t squeeze down all the way in between the others. Secure the Instant Pot lid, make sure the valve is set to sealing, and press “manual.” Set the time to 8 minutes. Allow the pressure to release naturally. When the float valve has dropped (indicating the pot is no longer at pressure), carefully remove the lid and turn the pot off. If you want to melt some cheese on top of your peppers, remove them from the Instant Pot and place them in a baking dish. Broil in the oven for 4-5 minutes. I like to top mine with fresh jalapenos too. Prepare your peppers by cutting the top off with the stem. Removed the seeds inside. Rinse the peppers and pat dry. Finely dice the onion and place in a large bowl. Add ground beef/turkey, rice, spices, salt, pepper, minced garlic, and panko crumbs. Add HALF of the fire roasted tomatoes to beef mixture and lightly toss to combine. 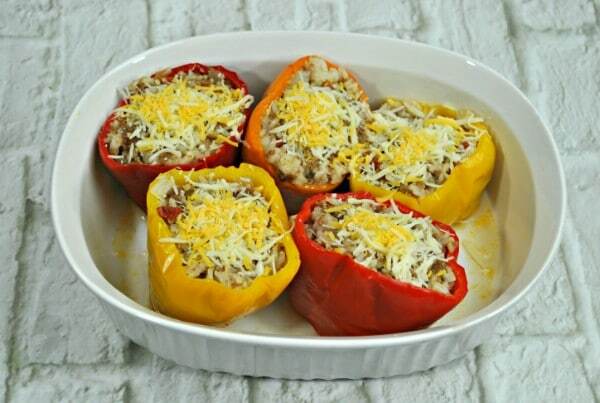 Fill peppers with beef mixture. 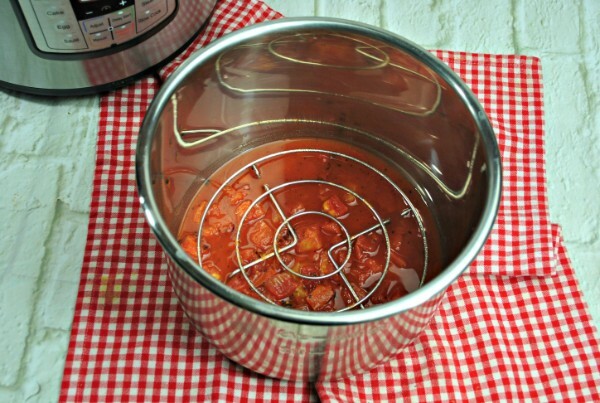 Add water to the bottom of the Instant Pot and top with the remaining fire roasted tomatoes. Place the steam rack over the tomatoes. Now place the stuffed peppers on top of the steam rack. Secure the lid. Turn the steam release to SEALING and press MANUAL. Set the time to 8 minutes. Remove each pepper and place in a baking dish. Top with cheese. Place in oven on broil for 4-5 minutes. Top with cilantro, jalapeños, green onions, sour cream or any other ingredients you desire! Weight Watchers Freestyle = 4 Points per serving. Calculation does not include cheese or sour cream. Place in oven on broil for 4-5 minutes. Top with fresh basil or any other ingredients you desire! Place in oven on broil for 4-5 minutes. Top with fresh parsley or any other ingredients you desire! Finely dice the onion and place in a large bowl. Add sausage, rice, spices, salt, pepper, minced garlic, and panko crumbs. Place in oven on broil for 4-5 minutes. Top with hot sauce or any other ingredients you desire! Do I need to brown the beef or will it cook inside Peppers? It cooks inside the peppers. 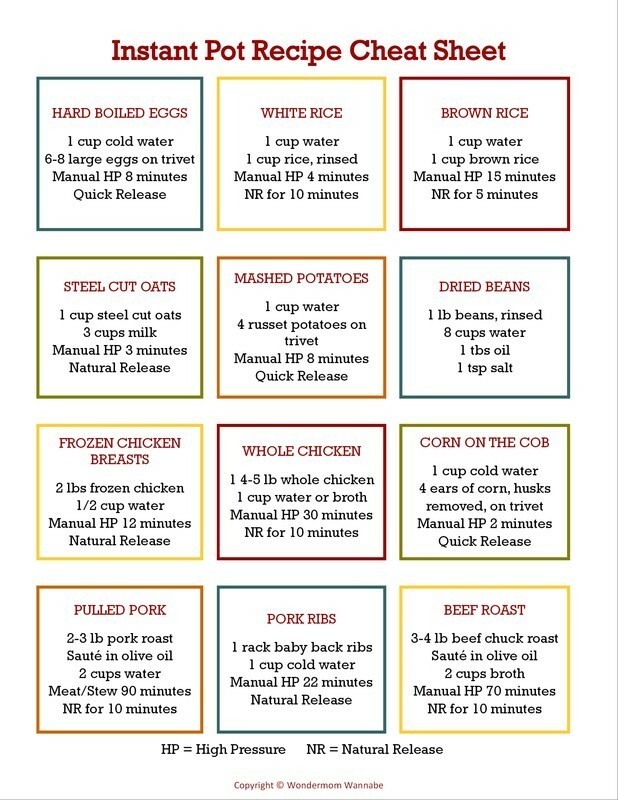 The variations are absolutely brilliant, but can they be added into the Recipe print box after the Recipe, that would be so much easier. Many thanks for the lovely Recipes. Hi Sally, thanks for the suggestion. I don’t have a way to add the variations to the recipe box, but I think I can create separate recipe cards for each variation and link them. I’ll work on that today. Thanks for catching that omission Mike! It’s a 14.5 ounce can (I used Hunt’s). I’ll add it to the recipe card too.